Offering you a complete choice of products which include draw bench machine, section draw bench machine and tube draw bench machine. Draw Bench Machine is manufactured using optimum quality raw material obtained from our reliable and dependable vendors. Draw bench machines are specifically designed under the supervision of our experienced professionals. The proposed selection is widely applauded and accepted for its tough construction, high durability, efficient performance and minimal maintenance. We are one of the noted manufacturers and exporters of Section Draw Bench Machine that is precisely designed and developed as per the industrial guidelines. Owing to the reliable performance, tough construction, longer functional life and ease of operation, the proffered machines are extremely popular. We provide the proposed range is standardized packaging. We are engaged in the manufacture and export of Tube Draw Bench Machine that is available at industry leading rates. 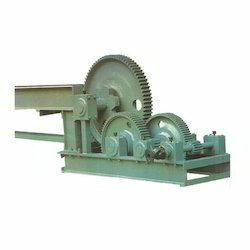 Manufactured in accordance with the preset industrial standards, these robust and operationally fluent machines are widely demanded in the market. Draw bench machines are used for performing cold work on metals. We test the range before the final dispatch.